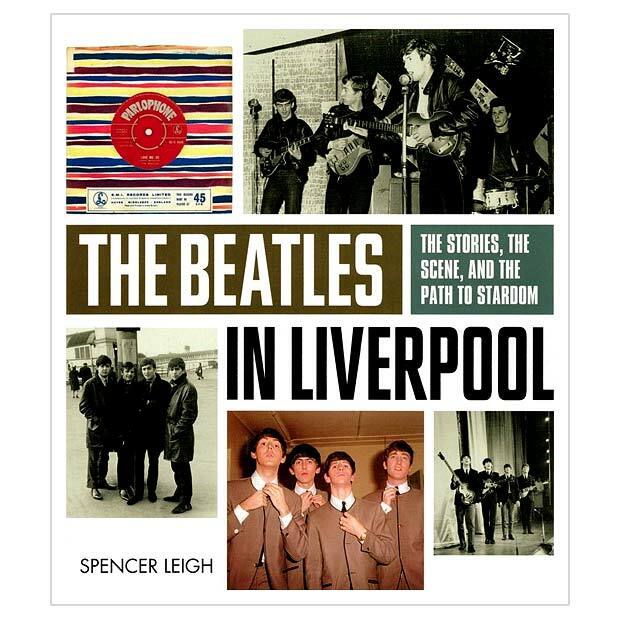 The Beatles In Liverpool is the companion volume to The Beatles In Hamburg, published in the UK by Omnibus Press in October 2012. SKU: Beatles In Liverpool. Category: Books. 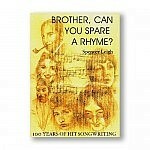 Tags: Spencer Leigh, The Beatles In Liverpool. 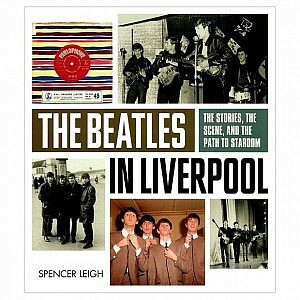 The Beatles In Liverpool book by Spencer Leigh has the same size and presentation as The Beatles In Hamburg. The photographs and the memorabilia look marvellous – the work of project manager Jane Struthers – and the book has been beautifully designed by Duncan Youel. Hope the text is okay too. 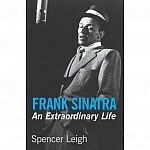 There is also an American edition, published by Chicago Review Press, but it is the Omnibus UK edition which is available through this website. Copies can be signed and dedicated if you wish. “The images in the book are especially fascinating. A companion to the Hamburg book and just as enjoyable.” (Five Star review in Goldmine by Gillian G Gaar). By way of sample text, here is a section on Nowhere Boy that had to be omitted for reasons of space. By now, we are used to bio-pics playing fast and loose with the truth. To some degree, they have to be that way as a film-maker has only a limited time to tell a story that lasts several years, and if there is considerable musical content, the time available is even less. The Oscar-winning films, Ray (about Ray Charles, 2004) and Walk The Line (about Johnny Cash, 2005) had their faults, but it is not worth being an anorak over the details. Both films conveyed a strong impression of the problems and dilemmas faced by these musicians. Nowhere Boy isn’t a Hollywood film – it’s partly funded by the National Lottery! – but the same principles apply. John Lennon was a complicated man as aggressive as he was vulnerable and, unlike Paul McCartney, he kept changing his mind. This is what makes him so fascinating. He would have been hell to live with, but it is a challenge for a film-maker to determine what made him tick. When the conceptual artist Sam Taylor-Wood announced that her first film would be about John Lennon’s adolescence, she said that it would be based upon the memoir, Imagine This, by John’s half-sister, Julia. I wasn’t there so I wouldn’t know (and neither was the young Baird most of the time) but the depiction of Aunt Mimi appeared cruel. In Baird’s eyes, Mimi Smith was hypocritical because she had an affair with a lodger. By comparison, the writing about her mother, Julia, touches hagiography. It is not clear what happened next. Probably Taylor-Wood and the screenwriter Matt Greenhalgh discovered, by talking to McCartney and others, that Mimi was not all bad. As a result, Julia Baird had her name removed from the film. It is unusual to praise a film for restraint but this happens with Nowhere Boy. There is only a hint of the relationship between Mimi and Michael Fishwick. Similarly, although John Lennon confessed to incestuous feelings towards his mother, these are not brought to fruition, despite the film’s eccentric by-line “Decidedly a love story rather than a John Lennon biopic.” These confessions were preparatory notes for an autobiography that he taped in 1979, and who knows what he had been taking that particular day? Philip Norman was irresponsible in attaching such weight to them in his biography, John Lennon: The Life (HarperCollins, 2008). In the film, it looks as though we are going to have an incestuous scene but Taylor-Wood holds back. Even though it is depriving itself of such dramas, Nowhere Boy works exceptionally well as a story about young musicians growing up in Liverpool. The relationship between John, his free-spirited mother who re-enters his life, and the prim and strict aunt who has raised him is beautifully drawn. In the most dramatic scene of the film, Julia admits to having a fourth child, a daughter, Victoria, who has been taken into care. Although John did know of this half-sister, we don’t know how he found out. The record that brings Julia and John together is Screamin’ Jay Hawkins’ ‘I Put A Spell On You’, released in 1958. There is no evidence that John was turned on by this wonderfully garish record although it’s reasonable to assume he was. I doubt that Julia would have gone into a café and played Jackie Brenston’s ‘Rocket 88’ on the juke-box. If she did, she was exceptionally enlightened, and the owner of the café even more so. Liverpool looks far better than it did at the time. In the opening sequence, John is seen weaving in and out amongst the columns of St. George’s Hall. The building is spotless, as it is today, but I doubt that John would have been doing that in the mid-1950s as the black building was still being used as law courts. The film is helped by superb performances. Kirstin Scott Thomas as Mimi and Anne-Marie Duff as Julia are exceptional, and although 19-year-old Aaron Johnson doesn’t resemble John Lennon, he captures his spirit. Despite his rebellious nature, I doubt that John ever rode on the roof of a double-decker bus and I doubt too that he would be swearing in front of Mimi. It is suggested in a couple of places that Julia was bipolar. This is conjecture upon conjecture, but is the implication that John Lennon was bipolar as well? Following his screenplay about Ian Curtis, Control (2007), Matt Greenhalgh’s script is very good, but the film must been cut from its intended length. Why otherwise employ such renowned actors as David Threlfall (Mimi’s husband, George) and David Morrissey (Julia’s partner, Bobby Dykins) and yet give them so little to do? The film performance of ‘In Spite Of All The Danger’ is far more accomplished than the real Quarry Men’s version. It is gratifying that Uncle George’s role in bringing up the young John Lennon is acknowledged, even though he is inebriated. There is no evidence that he was constantly drunk..
Rather than Ray or Walk The Line, I would compare this film with That’ll Be The Day (1973) in which the fictional Jim MacLaine (David Essex) drops out of school for his love of rock’n’roll. The fictional story packs more drama because we do not know whether MacLaine will make it. In Nowhere Boy, we know that no matter what Mimi says, John Lennon will become a world superstar. AS OF MARCH 2014, THIS BOOK HAS SOLD OUT. IT WILL HOPEFULLY BE REPRINTED.